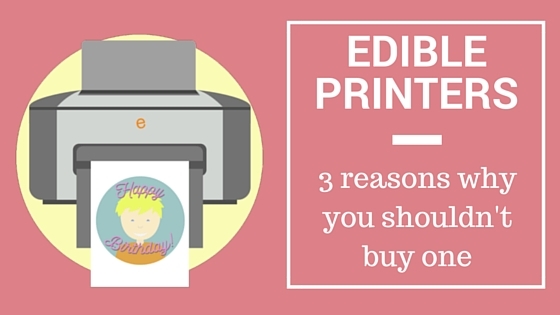 Yes that’s right, we’re giving you reasons when you shouldn’t invest in an edible printer and supplies. So why would we do this? Well, in some cases it can be more beneficial to continue to buy printed icing sheets from a local bakery or online – it all depends on how much you will be using it. Now don’t get us wrong, owning an edible printer is massively useful for the right individual or business. But this post is to challenge your thinking, and give you a better perspective of the financial and time implications before making your purchase. This post is based off the first email in our 7-day beginner course in Edible Printing. If you are just starting out in this area, this course is designed for you – feel free to sign up here. Financially, it costs at least $200-300 (USD) after investing in the equipment and supplies. Going to a local bakery, or ordering an icing sheet online will set you back around $10-15 (USD) per order. 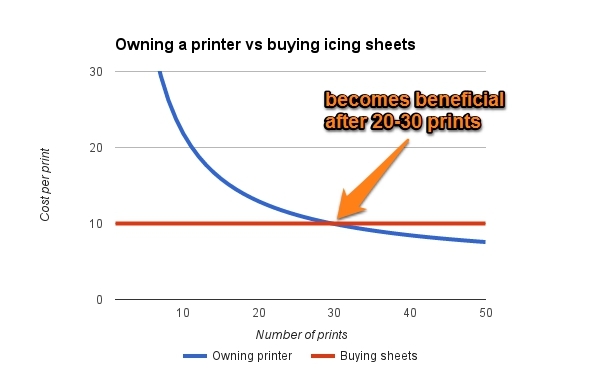 This means the benefits of owning an Edible Printer only start to pay off after around 20-30 prints within a year (see graph below). Why a year? Icing sheets and inks have a shelf life of around 12 months, and will need to be disposed of after this time. 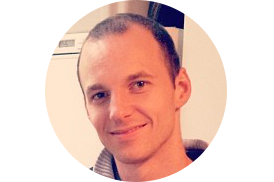 From a maintenance perspective, you should aim to print every 1-2 weeks as a minimum. How come? Well over time, ink collects and dry on the print heads, reducing its effectiveness and even blocking colours from printing. By printing every week this helps to keep your edible printer in good shape. If you’re printing less often, that’s ok, just make sure you’re still running a test print through every week. Perhaps you could print your everyday documents with edible ink! Although it doesn’t take long to get set up initially, it can take some time to master the skills for perfect prints. We’re still learning after many years of printing! 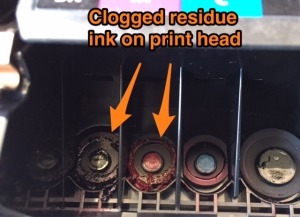 There is a bit of maintenance involved, and you are likely to encounter edible printing problems over the printer’s lifetime. So it is important to know how much you value your time, if edible printing will be important to your business. However if you’re willing to learn, the good news is though you’re in the right company. 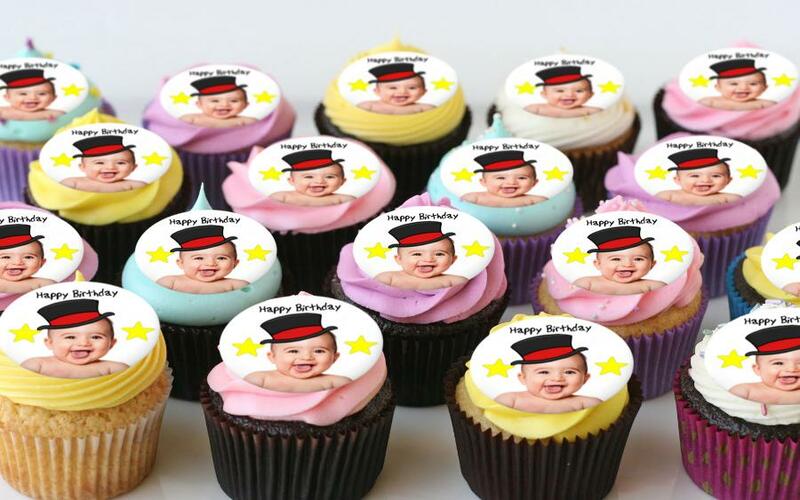 Here at Topperoo we’re on a mission to transform the edible printing world. We have a range of free and paid solutions to help you save time printing and grow your sales, and we’re always here to support if you’re stuck. Just drop us a note in the comments below! Key Takeaway: Be aware of the financial and time impacts of buying an edible printer, in some cases you may want to stay with ordering your edible images separately. Otherwise, if you’re ready to get started, sign up to our beginner email course in edible printing where we walk you through the step-by-step process in getting up and running.